Bishop Richard Malone addresses the media. The meeting with clergy, held inside Infant of Prague Church in Cheektowaga, was private. When addressing that meeting with media later that afternoon, Bishop Malone acknowledged how the atmosphere of the current crisis has made daily ministry difficult for priests. He said that he assured the men in attendance that people of faith, from church leaders to lay people, will purify the church they love, renew it and make it stronger. "I shared with them, and they agreed, that too much is at stake: the faith and commitment of our people, the healing of victims, even our very mission in the world," Bishop Malone said. He renewed his stance that he would not resign, saying doing do would create more instability at a time when stability is needed to address the crisis. In his words, "I know that there may not be a high level of trust right now but I do believe that, working with others who continue to believe in me, we can steer through this storm into a calm sea." 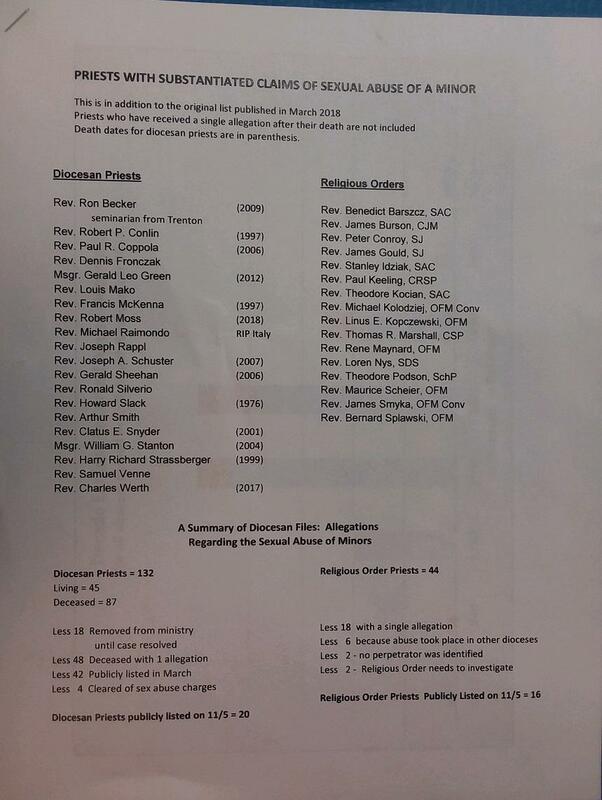 Church officials released a new list of the names of 36 priests - 20 of them diocesan priests and the others belonging to religious orders - who have "substantiated claims of sexual abuse of a minor." Some have been identified in previous news reporters as being accused. The most recent clergy put on administrative leave amidst abuse claims, all happening within the past week, were not on that list: Monsignor Frederick Leising, Father Ronald Sajdak and Father Michael Juran. 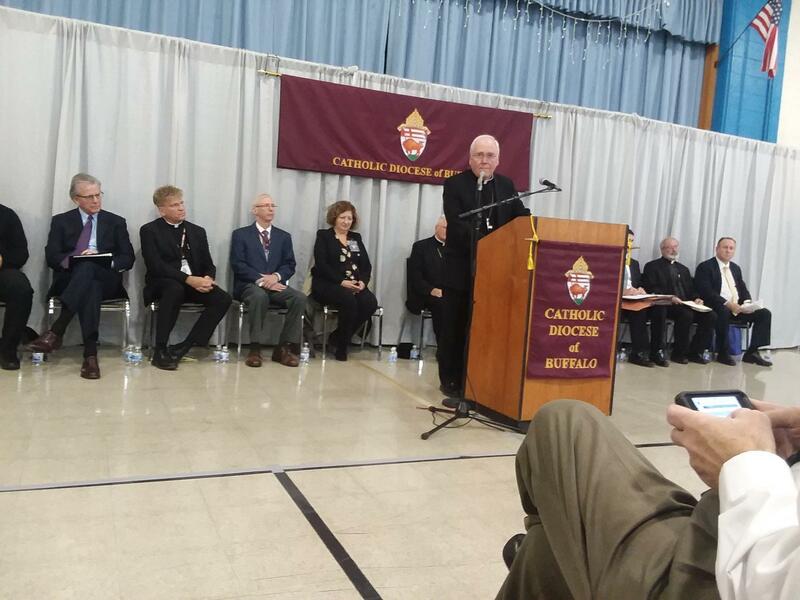 A copy of the list of priests identified as havng "substantial claims of sexual abuse of a minor" was released Monday by diocesan officials during Bishop Richard Malone's news conference in Cheektowaga. Speaking for a siginificant portion of the news conference was Buffalo Diocese Attorney Lawlor Quinlan, who said Bishop Malone didn’t expect the response of new claims to be so overwhelming. Those claims came following the formation of the Independent Reconciliation and Compensation Program by the Diocese of Buffalo earlier this year. Quinlan explained that the diocese is required to provide an annual audit including the number of new claims received each year. Receiving a new complaint in a given year, he explained, doesn't necessarily mean the alleged abuse happened within that time span. Quinlan said that most of these claims occurred in the 1960s and 1970s. Many have compared these numerous claims to the situation in Boston decades ago. Quinlan said just like there, the situation in Buffalo was mishandled in several ways. “Did the church here in Buffalo, make the same sorts of bad decisions like that before 2002? Yes it did. Sometimes it was handled correctly. Sometimes the right thing was done and the abuser was removed from the ministry. But sometimes the abuse continued on and what you see in the news happened,” he said. Malone said he's made some missteps along the way, but dedicated to making things right in the future. He also dismissed suggestions he lacks empathy toward the victims. "You'd have to be able to sit with me and watch, which never happens because it's a confidential setting, to see that I don't think I lack empathy. Sometimes it's heartbreaking... always it's heartbreaking," the bishop said. He added he does not want to be "ambushed" by news media or people claiming abuse against them. Outside the church, as priests were arriving for their meeting, about a dozen individuals stood holding signs, some calling for the bishop's resignation but others showing support for the larger population of priests. They called out "we love you, thank you for your vocation" as clergy passed. One led them in prayer before heading inside. "They need to say what they feel in their heart to the bishop, to say their honest truth and what they believe should come of this," said Barb Hyla, who was among those expressing support for local priests. "We are their sheep and they need to protect us as well."